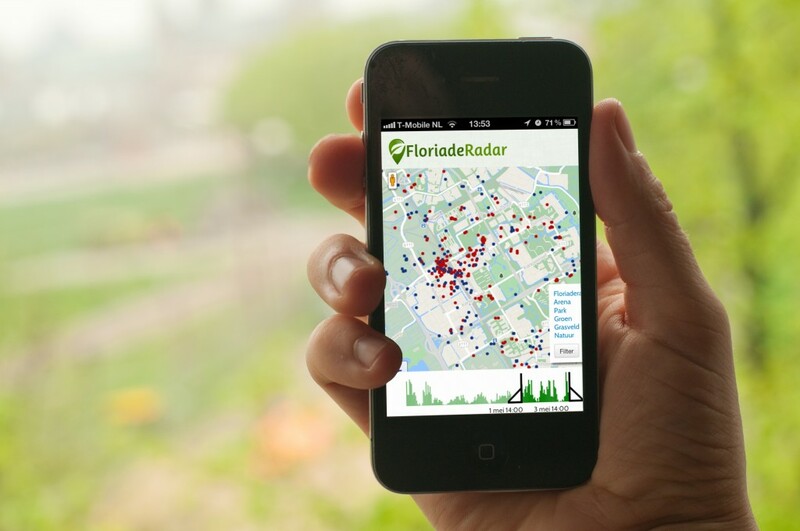 The FloriadeRadar was an experiment into mapping the social-media landscape as a tool for urban planning. It was commissioned by the Gemeente Amsterdam Dienst Ruimtelijke Ordening (Amsterdam Physical Planning Department) as part of Amsterdam’s bid to host the 2022 Floriade (the Dutch national horticultural expo) in the Bijlmer. It harnessed and filtered the activity of three popular social-media services into a real-time online map interface, making it simple and fast for sense to be made from the huge volume of digital activity that addresses the city and its public space. Conceptually, the aim of the project was to provide a democratic, immediate and up-to-date feedback system for the inhabitants of Amsterdam so that faster and better informed planning decisions could be made by the city. Social-media already offered a wealth of instant and honest commentary on the city; FloriadeRadar solidified this overwhelming cloud of relevant social-media into a focused, concrete system. The resulting real-time and completely honest feedback tool could identify, track and visualise which places and issues shifted in and out of the focus of social-media over time. Technically, FloriadeRadar was a dedicated server that scraped and permanently stored every Verbeter de Buurt post, Instagram photo and Twitter post in the Amsterdam area in real-time. Every post or tweet became represented by a point in an interactive map, or an overview of all activity was represented by a heatmap similar to a rain- or weather-radar. An interactive timeline and keyword-filter allowed all of this data to be filtered based on location, time and content. Arjan Scherpenisse (MiracleThings) created “an Erlang-powered location-based-services aggregator engine with a Google maps browsing interface”. The 2022 Floriade would have been a huge stimulus for the transformation and modernisation of the Bijlmer, one of the neighbourhoods in Amsterdam with the poorest image. The FloriadeRadar itself was an important part of the city’s bid (and long-term strategy) to encourage the development of modern technologies and methods of responding to the needs of its citizens. Unfortunately, the project was discontinued when Almere was selected as the host for the 2022 exposition. Non-fiction is still developing and promoting FloriadeRadar. The city of Amsterdam is now deploying it as part of its plans to stimulate the development of Amstel III, a neighbourhood currently over-dominated by commercial offices.